Curiosity rover is getting ready to zap its first Martian rock. A small stone lying just to the side of the vehicle at its landing site on the floor of Gale Crater has been selected as a test target for the ChemCam laser. The brief but powerful burst of light from this instrument will vaporize the surface of the rock, revealing details of its basic chemistry. Dubbed N165, the object is not expected to have any science value, but should show ChemCam is ready for serious work. “I’d probably guess this is a typical Mars basalt – basaltic rocks making up a large fraction of all the igneous rocks on Mars,” said Roger Wiens, the instrument’s principal investigator. “A basalt, which is also common under the ocean on Earth, typically has 48% silicon dioxide and percent amounts of iron, calcium and magnesium, and sodium and potassium oxides as well. We’re not expecting any surprises,” said the Los Alamos National Laboratory researcher. Curiosity touched down in its equatorial crater two weeks ago. Its mission is to investigate the rocks at its landing site for evidence that past environments could have supported life. The rover carries a suite of instruments for the purpose, but its Chemistry and Camera (ChemCam) experiment has probably garnered most attention because nothing like it has ever been flown to Mars before. ChemCam sits high up on the rover’s mast from where it directs a laser beam on to rocks up to 7 m (23 ft) away. The spot hit by the infrared laser gets more than a million watts of power focused on it for five one-billionths of a second. This produces a spark that the instrument observes with a telescope. The colors tell scientists which atomic elements are present in the rock. ChemCam is going to be a key part of the process of selecting science targets during Curiosity’s two-year mission. If the laser shows up an interesting rock, the vehicle will move closer and deploy its other instruments for a more detailed investigation. Assuming the test with the 7 cm-wide N165 object goes well, ChemCam will move on to its first science target. This will be rock exposed on the ground next to the rover by the rocket-powered crane used to lower the vehicle to the crater floor. Exhaust from this descent stage scattered surface grit and pebbles to reveal a harder, compact material underneath. The crane made four scour marks in the ground – two either side of Curiosity. These have been dubbed Burnside, Goulburn, Hepburn and Sleepy Dragon. The names, all related to fire, are taken from ancient rock formations in Canadian North America. Goulburn Scour will be zapped by ChemCam. “There’s bedrock exposed beneath the soil with interesting patterns of color,” said John Grotzinger, Curiosity’s project scientist. Curiosity has not moved since landing on 6 August (GMT). That is about to change. The rover is going to roll forward briefly to test its locomotion system in the next few days. A reverse manoeuvre is planned, also. Researchers want eventually to drive several kilometres to the base of the big mountain at the centre of Gale Crater to study sediments that look from satellite pictures to have been laid down in the presence of abundant water. 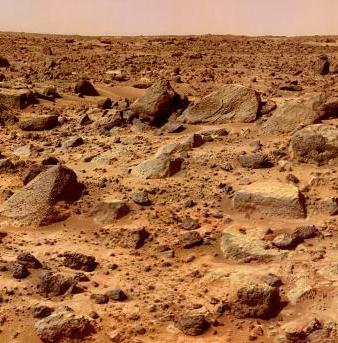 This journey to the foothills of Mount Sharp is going to have to wait a few months, however, because the science team intends first to go in the opposite direction. Several hundred metres to the east of Curiosity’s present position is an intersection of three geological terrains. Again, this location has been given a name – Glenelg. And, again, it is taken from the geology of North America. The intersection is intriguing and a good place to compare and contrast with the bedrock exposed in Goulburn Scour. In addition, it may provide access to older, harder rocks. These could make for a first opportunity for Curiosity to use its drill. “Even though it is in the opposite direction from the path to Mount Sharp, it’s the one place we can go to capture a lot of the information that’s persevered in our landing [location],” said Prof. John Grotzinger.